Palms are a uniquely tropical group of exotic plants. Not only are palms symbolic of sandy beaches and vacations, they are diverse family of plants that include compact species and tall trees over 100 feet tall. Fortunately, for homeowners who want that tropical look there are palms that withstand harsh conditions and can fit in any setting. For yards large and small, there are palms for nearly every landscape. Many palms can also be grown in pots for urban dwellers craving a lush oasis. 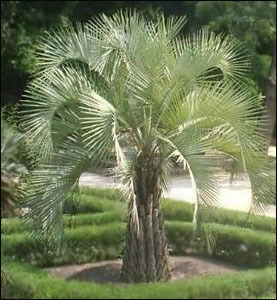 Butia capitata, the Pindo Palm, is one of the more cold-tolerant of the palms. Although the Pindo palm can withstand occasional frost, it is also drought tolerant. A native to the South American savannahs, the pindo palm is right at home in zones 8 and 9. Pindo palms stay under 20 feet tall and have a relatively compact form, making them an excellent choice for urban landscaping. Pindo palms are suitable for full sun and partial shade. Most pindos retain their dead leaf stalk for years. It’s not uncommon to see pindo palms with their trucks covered entirely with brown leaf stalks. Mature specimens that are regularly pruned tend to have open trucks. Pindo palms are versatile landscaping plants equally effective in groups or as specimens. Phoenix Roebelenii, or Pigmy Date Palm, resembles the common date palm, but is one tenth the size. Pigmy date palms are extremely popular landscape plants, which are also used in container and indoor plantings. Pigmy date palms are single trunked in nature, but multi-trunk clumps are very popular for landscape specimens. Plants have long slender trucks covered with brown leaf bases. Pigmy date palms are slow growers, eventually reaching 8-10 ft, which makes them great for small spaces. Trachycarpus fortunei, also called Windmill Palm, Chusan Palm, or Chinese Fan Palm is a native to Southeast Asia. Windmill palms start-off small, but reaches 20-40 feet at maturity. Windmill palms are easy to recognize by their spiraling fronds with circular leaf segments. Plants prefer partial shade and well draining soil, but they are also partially drought tolerant and suitable for growing in pots.. When grown in full sun, plants are more compact. Windmill palms are moderately salt tolerant, if shielded from direct spray. Single specimens and trios of windmill palms in varying heights are two of the most popular arrangements for these landscape plantings. Washingtonia robusta. or Mexican Fan Palm, is one of the taller landscape palms, towering over other trees at 100 feet tall. Mexican fan lams are popular for formal plantings, groves, boulevards, and large estates. Plants have massive trunks and the dead fronds form large skirts that must be trimmed by a professional. Mexican fan palms are salt resistant and fast growing, which makes them a good choice for sites in coastal areas. Syagrus romanzoffianum, or Queen Palm, is a classic boulevard tree. Queen palms are tall and dramatic and about half the size of Mexican fan palms. Queen palms are native to South America and grow up to fifty feet tall. Plants are easy to grow and tolerate to a wide-range of soil conditions. Queen palms are one of the more dramatic landscape palms, suitable for formal or informal groupings. These palms are very fast growers. In a few years they will grown into large landscape features.